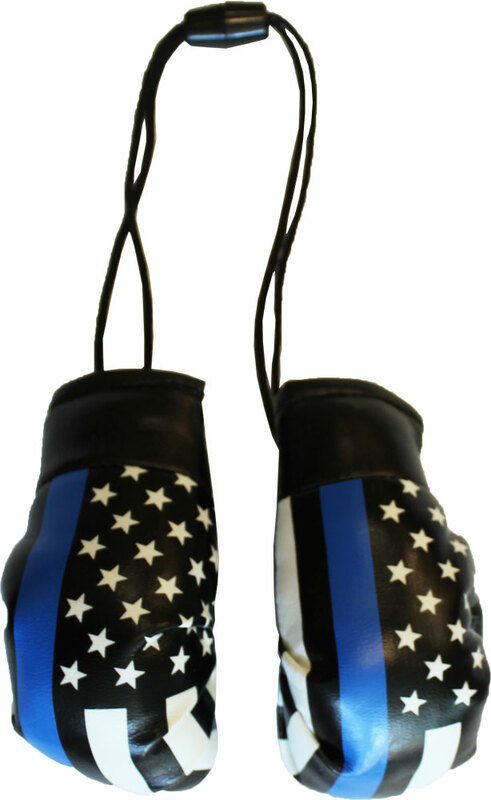 Our vinyl Thin Blue Line boxing gloves are a great way to show your pride, and look stylish hanging from your rear view mirror. The two gloves are connected with a plastic snap so they can easily be displayed together or apart. The Thin Blue Line Flag originated in the United Kingdom: the blue line represents law enforcement, the black field on the top represents the public while the black field on the bottom represents the criminals. The idea behind the graphic is that law enforcement (the blue line) is what stands between the violence and the would-be victims of crime. The Thin Blue Line USA flag incorporates the American flag into the Thin Blue Line concept and is made in the USA.